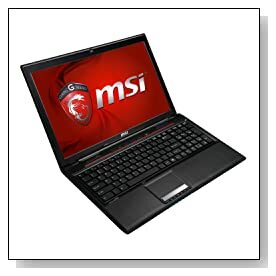 MSI Computer GE60 Apache-629; 9S7-16GH11-629 is a 15.6 inch fast, responsive and powerful gaming laptop that is easy to set up and operate for your day-to-day work and entertainment as well as very demanding programs (a decent gaming computer at a budget price with the NVIDIA GTX 850M but sure is not just for gaming, Haswell Intel i7-4710HQ with an 8GB memory will excel at whatever you throw at it). It comes with great specs, features, connectivity options and Steelseries keyboard and offers really good value for money, as you will probably see as we go through its different features now. 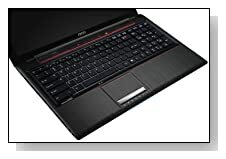 MSI GE60 Apache-629 is offered with the lower power consumption (Thermal Design Power- TDP of 47 watts) 4th generation quad core Intel i7-4710HQ processor (6MB L3 cache) with CPU Passmark benchmark score of 7909, at 2.5 GHz base speed that can be over-clocked up to 3.5GHz with turbo boost and hyper threading for better utilisation of the CPU (4 cores to handle 8 threads in parallel), 8 GB DDR3L SDRAM at 1600MHz for great multitasking of demanding stuff with ease and that can be expanded up to 16GB if needed as it comes with a second memory slot, a generous 1024GB of Serial ATA hard drive with fast 7200rpm rotating speed and Windows 8.1 operating system. 15.6 inch Full HD anti-reflective widescreen display with 1920 x 1080 pixel resolution offers very sharp and clear images and vivid colours and discrete NVIDIA GeForce GTX 850M graphics card with 2GB DDR3 dedicated VRAM (as well as the integrated Intel HD 4600 graphics card that is up to 60% faster than the Intel HD 4000) means great multimedia playing/editing and proper medium level gaming- you can play games like Crysis 3, Battlefield 4 and Titanfall at medium resolutions and BioShock Infinite and Tomb Raider fluently at high settings and in Full HD and with the GeForce Battery Boost, battery life will be extended twice. It comes with four speakers (4 x 2W) with 4-channel surround sound and subwoofer with deep bass so you will enjoy your games and movies more. Webcam is a 720p high definition and is good for chatting live with friends and family. Apart from its own 15.6 inch display, system supports 2 more external monitors (or projector) and you can multi task efficiently with the Matrix multi-monitor display. Black and red MSI GE 60 Apache weighs 5.28 pounds and measures 15.10 x 9.90 x 1.46 inches- not a very thick gaming PC and offers relatively easy portability. SteelSeries customisable gaming keyboard is not backlit (contrary to what is specified on some websites) but is ergonomic and comfy to type on, offers great gaming experience and has 10 key numpad and a responsive trackpad without separate left and right click buttons (is a one button bar but clicking left will be left click and right will be right). Our guess would be the 6-cell lithium ion battery should give you up to 4-5 hours on average use. It has a DVD SuperMulti optical drive to let you play games or videos in DVD format and 2 USB 3.0 ports, 2 USB 2.0 ports, Multiformat media reader that supports SD/SDHC/SDXC formats, 802.11ac dual-band 2 x 2 Wi-Fi with Miracast (faster connection and wider coverage for speeds up to 867 Mbps), Bluetooth 4.0, 10/100/1000 Ethernet LAN for easy wired internet, an HDMI port, a VGA port and Headset AMP + Gold Flash jacks. Conclusion: Let’s first do the cons of the MSI GE60 Apache-629 .. As mentioned above, keyboard is not backlit so you shouldn’t look for a button to turn the lights on. It doesn’t come with a Solid State Drive but with a faster than normal regular HDD of ample 1TB size so if you’d like to add SSD to make it snappier overall, your best bet would be to put it in the HDD bay and move the HDD to the optical drive bay. Another obvious con would be the operating system- Windows 8.1 that is still not very much liked by customers but that’s what majority of modern day computers have and 8.1 is better than the previous Windows 8. And you may want to remove some unnecessary software that come with it when you first turn it on so you get better and quieter performance overall. Now the pros.. It comes with 2 years limited parts and labor warranty- longer than the average 1 year on majority of laptops. Intel i7-4710HQ is a very powerful processor and has the Passmark benchmark score of 7909 on the day of this review. The NVIDIA GTX 850M allows decent mid-range gaming and you will play not so demanding games at highest settings at FHD and the most demanding games at lower settings and details. Killer N3160 Wireless-AC and Killer E2200 Game Networking are nice to have and offer fast wireless and wired access. Screen is Full HD with 1920x1080 pixel resolution so you get to enjoy very clear image and it has quad speakers with subwoofers which make the sound quality quite all right- both through the speakers and headsets. Great value gaming laptop and very much recommended, unless you want to spend heaps more for a higher level system.